This is a Grand Tour Souvenir Piece Featuring Several Large Sails Each Puffed Out as if Full of Wind. 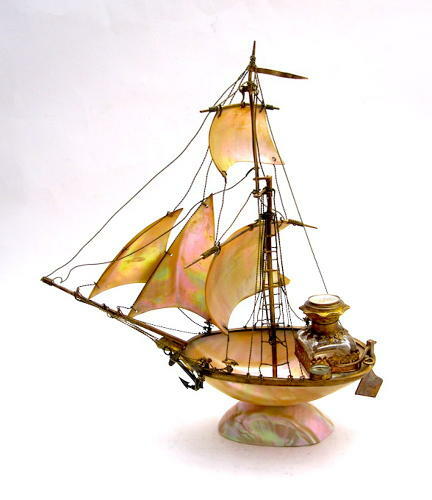 The Deck and Base are also Crafted from Mother Pearl and Bronze 'Rigging' Detail and there is also a Wonderful Compass and Anchor. At the Side is Housed a Perfume Bottle with a Minature and an Original Insided Stopper. The Front has a Fine Dore Bronze Dolphin Feature.